With the 199th pick in the 2000 NFL Draft the New England Patriots select from Michigan, quarterback Tom Brady. Those words spoken by then NFL Commissioner Paul Tagliabue would change the future of the the Patriots and the NFL. 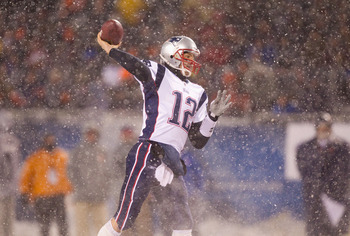 Tom Brady has gone on to have a great career and is considered to be one of the best quarterbacks of not only his era but in football history. Brady has led the Patriots to 5 Super Bowl appearances and 3 Championships. He is the biggest late round draft pick ever, being selected in the 6th round. But their were 6 QB’s selected before Brady. Here is a look at the six that came before Brady and the teams that missed out on greatness. Pennington was the most hyped QB going into the draft. Pennington had a solid college career with Marshall. Pennington retired after the 2010 season. He played for the Jets the majority of his career and played his final 3 season with the Miami Dolphins. Pennington would play in 4 post seasons and had a post season record of 2 wins and 4 loses. Pennington did make history during his career, holding the record for career passing percentage among QB’s with more than 1500 pass attempts at 66.0%. Carmazzi played at Hofstra during his college years. He would never play in a regular season NGL game. Carmazzi finished his pro football career in the CFL in 2005. Redman has played for the Ravens, Patriots, Titans and most recently the Falcons before his release in August of 2012. He was lucky enough to win a Super Bowl ring as a backup to Trent Dilfer on the 2000 Ravens championship team. Redman would best be described as a career back up QB. Tee Martin played only one game for the Steelers and never started a game in his career. He spent the 2002 season in NFL Europe playing for the Rhein Fire. In 2003 he signed with the Oakland Raiders for his final NFL season. Martin ended his professional career in 2005 as a part of the CFL. In total Martin played only 3 games in the NFL. Marc Bulger was the only Pro Bowl QB selected before Tom Brady. In the first of his two Pro Bowl appearances Bulger won the MVP award in that game. He went on a crazy ride after the draft by signing with the Saints, Falcons and the Ravens before the 2000 season began. Bulger took over at QB for the Rams when Kurt Warner retired. Bulger retired in 2010 with the Ravens. Spergon Wynn spent his career as a back up QB. He played for 2 NFL teams and 4 CFL teams. Wynn retired from football in 2006. The list QB’s selected before Tom Brady is pretty shocking. Only one of those players made it to a Pro Bowl. The majority were career back up QB’s and none of these players are still professionally active. There was a lot of belief that Brady’s frame was not built for the NFL which was the greatest ding against him. The Patriots saw something in Brady that no other team did and they were able to reap the benefits of that faith. When Tom Brady retires he will undoubtedly head to the Hall Of Fame and the history books. While all of the others before him are just history. Week 2 of the College Football is over just in time for the first Sunday of NFL action. There were some great games and performances on Saturday. Let’s take our weekly look at 2centsworthofsports.com’s top 3 stories of NCAA action. Texas A&M and Missouri made their SEC debuts on Saturday. Much was said and predicted about their debuts in one of College Football’s best conference. Both teams played two of the toughest teams in the SEC, the Florida Gators and Georgia Bulldogs respectively. A&M hosted the number 24th ranked Florida Gators at home and played the Gators in a nail biter. The game was close the entire time and came down to a winning TD for Florida to take the game. The final score was 20-17 for UF over Texas A&M. In Missouri there was another great game that was really close until the 4th quarter where the number 7th ranked Bulldogs pulled away from Missouri, scoring 17 points in the last quarter. The final score was 41-20 in favor of UGA. It was a rough day for both debuting teams, they did however show they belong in the powerhouse conference. The 2nd ranked team in the country the USC Trojans came into New York to play Syracuse. The game was not as easy of a win that many expected for the Trojans, winning 49-29 on the road and advancing their record to 2-0. Matt Barkley’s performance is the biggest story of this game. Barkley was 23 for 30 passing with 187 yards and 6 touchdowns. Barkley only threw 1 interception the entire game. Barkley has really developed into the player he was expected to be coming out of high school just a couple of years ago. This was a great statement making performance for the USC quarterback. In what was the biggest upset of a ranked team this Saturday, Oregon State defeated Wisconsin. This game was a low scoring affair with the final score of 10-7 in favor of the Beavers. The star of the game for the Beavers was their QB Sean Mannion who had 276 yards passing and 1 touchdown pass. The Wisconsin Badgers really under played themselves in this road game. The Badgers will have to make some adjustments going ahead into the season if they want to remain in the top 25 rankings. The Beavers could likely end up in the top 25 with this win.